I hadn’t really touched the granny square blanket this weekend – but I got some work done to it last weekend, so I thought I would show its progress! Still a long way to go…. 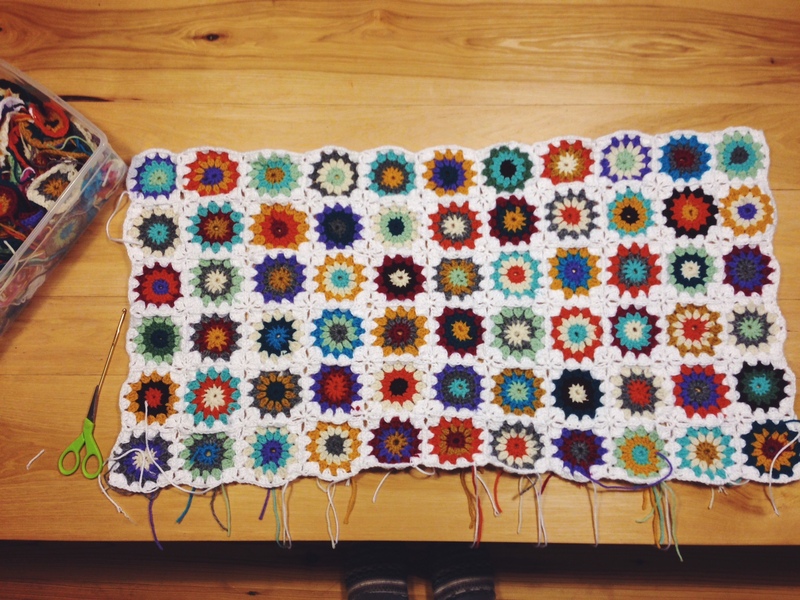 A few weeks into the year and I’ve been making some progress on the granny square blanket. Here’s to keeping the momentum going! Milo loves following patterns, puzzles, and building legos. So perler beads are a great activity for him! After seeing how much he enjoyed a few of the $1 kits from Micheals, I bought him a giant tub of them. So we have been busy looking at what people have created with them and then getting inspired to make our own creations. 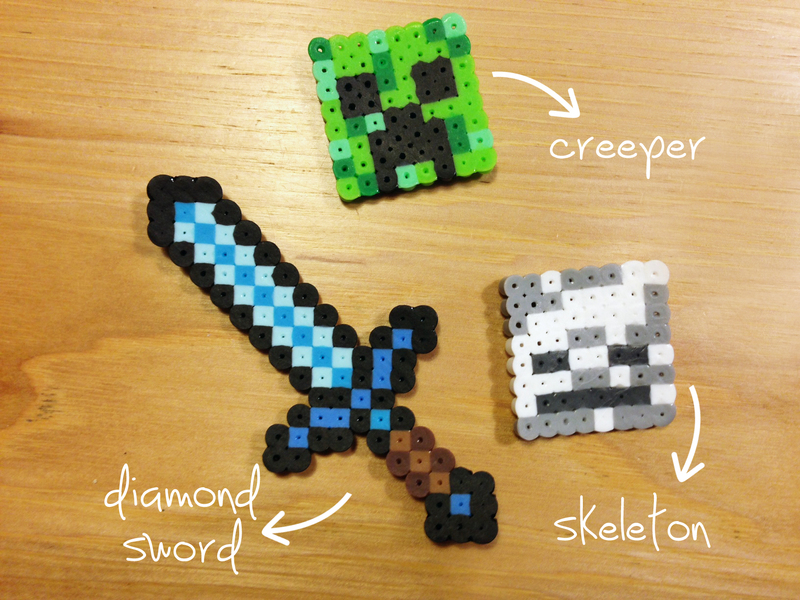 Milo has recently been playing minecraft, so we thought these little characters would translate well into the beads. He loved how these turned out – I especially love the sword. He took these to school the next day to show his friends, so that declares these an absolute success! HA! 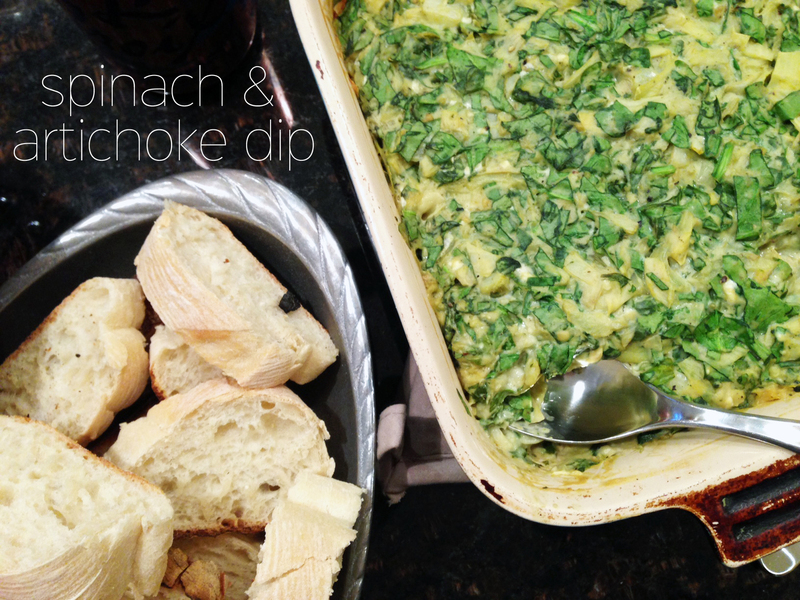 I made this dip for new years eve and it was so so delicious. I think I ate half the dip myself! 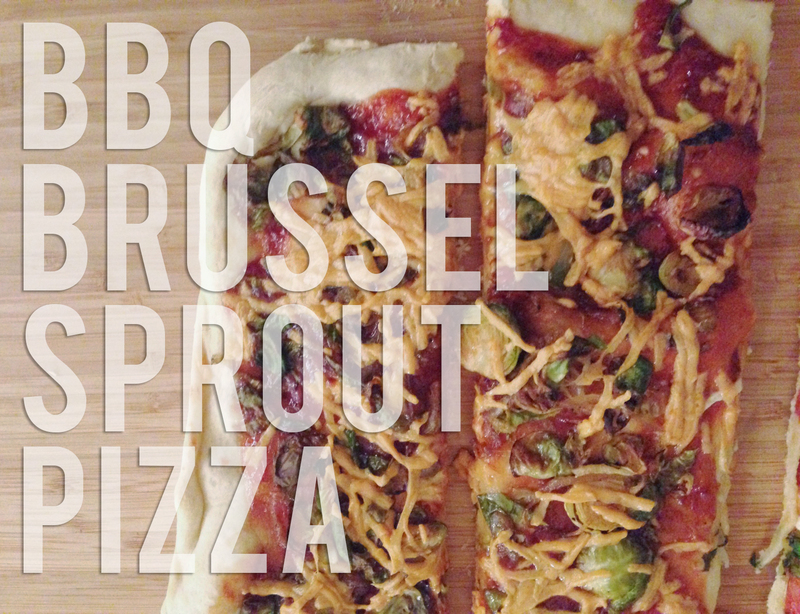 Its creamy and garlicky – this is definitely going to be my go-to party food! We served it warm with crusty bread, and with some pita chips. If you have a vitamix, it comes together very quickly too! I found the recipe here, but modified it a bit to my liking. Toss together the artichoke hearts, spinach, white onion, garlic, black pepper, and chili flakes (if using), and put into an 8×8 pan. Combine all ingredients in a vitamix or food processor (if not using a vitamix, make sure to soak your cashews!) until smooth. Pour the mixture into a saucepan and turn the heat to medium. Stir every few seconds, making sure to scrape around the bottom of the saucepan to keep from sticking. Stir until this thickens, Once it thickens, I added about a half cup more of soymilk, and a cup or so of shredded daiya. Reduce the heat to medium-low and cook for another 2 minutes, then remove from the heat. Pour this cheese over your dip that is in the pan and mix together. Preheat the oven to 350 degrees. Bake for about 20 minutes, or until hot all the way through and the top is slightly crusty and browned. I’m playing catch up for christmas here….I made another project from the quilts my husband’s great grandmother made. This time I turned it into a bunny for my mother in law for christmas. I used this pattern from purl soho. It was fairly easy to understand – I had some trouble but mostly b/c the quilt was so tattered and delicate in some places. This was actually my second one because the original one kept tearing because the quilt was in such bad shape. I was much more careful with this one and used pieces of the quilt that were in better standing. I love how this turned out and I think it will make a lovely keepsake. 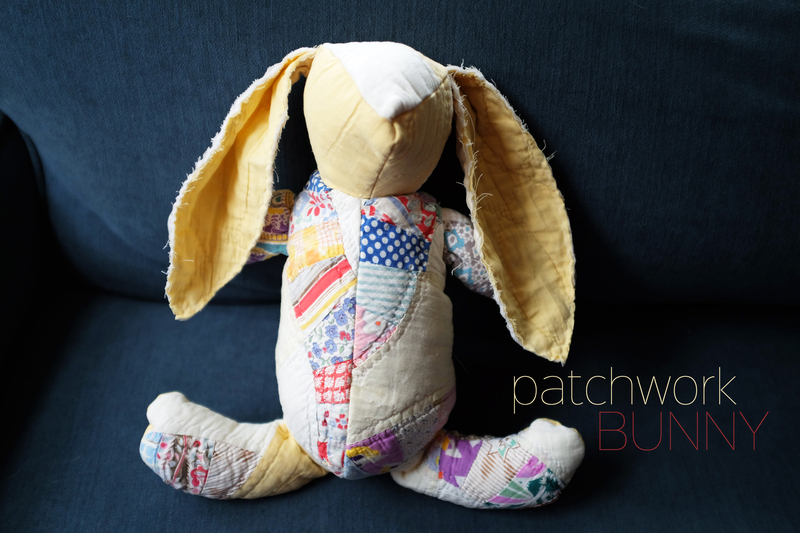 I really enjoyed this pattern though and I want to make some using regular fabric, or felt, as it suggests, so stay tune for that! I think they would make great baby gifts. This blog, which started as new years resolution to make something every day, is now entering its fourth year! I’m going to try to keep at it again this year – not blogging every day, but im going to continue to make things and document them here! One thing I’d like to do more of is crochet. Or at least crochet away my my yarn stash! This granny square project has been haunting me for almost 5 years. I started it with the intention to make a granny square blanket. I had never crocheted in my life, and I hit up some friends one afternoon determined NOT to learn how to crochet, but how to crochet a granny square, and a granny square only. I swore I had enough hobbies and didn’t need any more! So they taught me how to make a granny square and I made about 100 of them for a few months while my son was a baby. I then took a stab at a few more projects since then and have realized that I DO really like crocheting and I understand it A WHOLE lot more than knitting. Im able to figure out projects on my own and things just make sense to me. Also, it seems that I can usually find a you tube video that helps me through what im trying to figure out. This bag of granny squares has been staring at me all these years and I’m determined to do something about it this year! 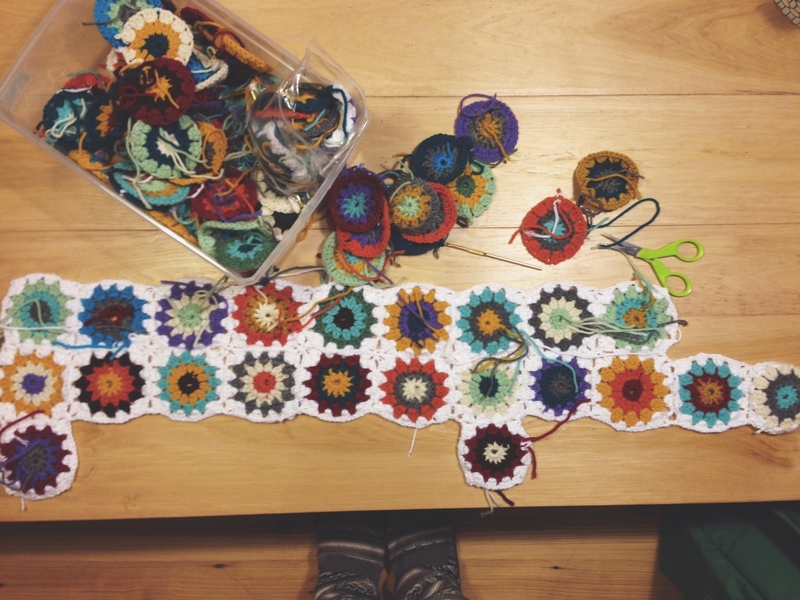 Ive seen granny square a day projects, and I think about starting one EVERY year, but I already have so many made….What I really need to know how to do is connect these babies. OH and remember how the heck we actually made these squares so that I can make more…. 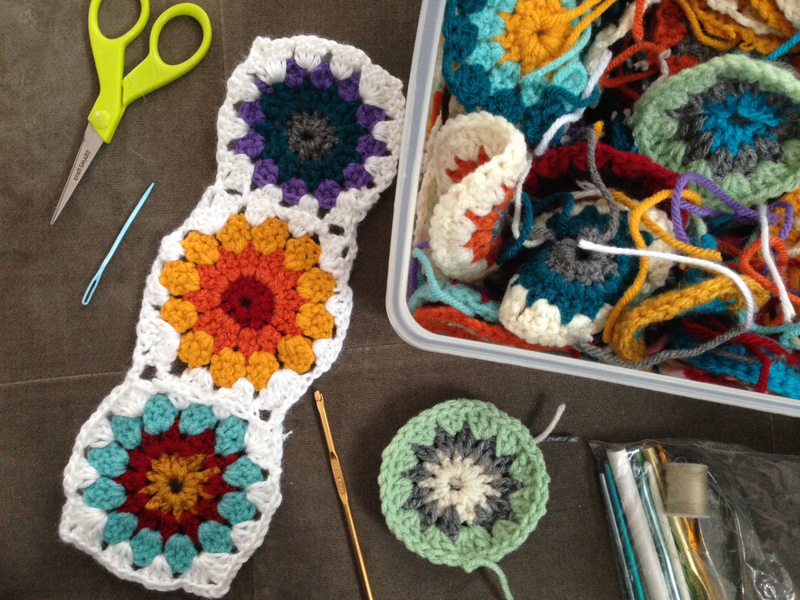 I took a look at how to make other granny squares with a round center and after a few trial and error attempts – I figured it out. And now that I understand HOW to crochet, these were a breeze to whip up and they look so much more consistent than they have in the previous ones I’ve created. So I weeded some out. I don’t have 100 anymore. Im ok with that because I have so much yarn laying around I can easily whip up some more. And they look so much better. Next up: connecting these bad boys. I tried whip stitching them and I tried connecting with single crochets. But heres the problem; since I didn’t really know what I was doing, when I initially made all these, they are all different sizes. They aren’t really consistent. And when I crochet them together it doesn’t lie flat and looks kind of awful. I sat on it for a few days and realized its ok; this first 100 were a learning process and now that I know what I’m going to do, I’m going to just start over. I think that crocheting them as you go method would look much nicer anyway. But THEN I realized, that I could just cut the white border off the ones I ALREADY made, and the crocheting as you go method WILL work and I can save a lot of the work I already did! I got rid of about 1/3 of them b/c they were kind of on the bigger side (probably from when I was still learning) and started making a whole bunch more on my own. I probably made about close to 30 this weekend. I started to do the crochet as you go method, as well as sewing in the ends and I have about 12 crocheted together now and I’m SO much happier with it than when I started. AND the thought that I will actually complete this project this year makes me really really happy! So I will continue to keep you posted on my progress with this blanket, but for now I’m excited that this project that I was so passionate about, will finally get some love again! Happy new year! Gingerbread cookies are probably one of my favorite holiday treats. 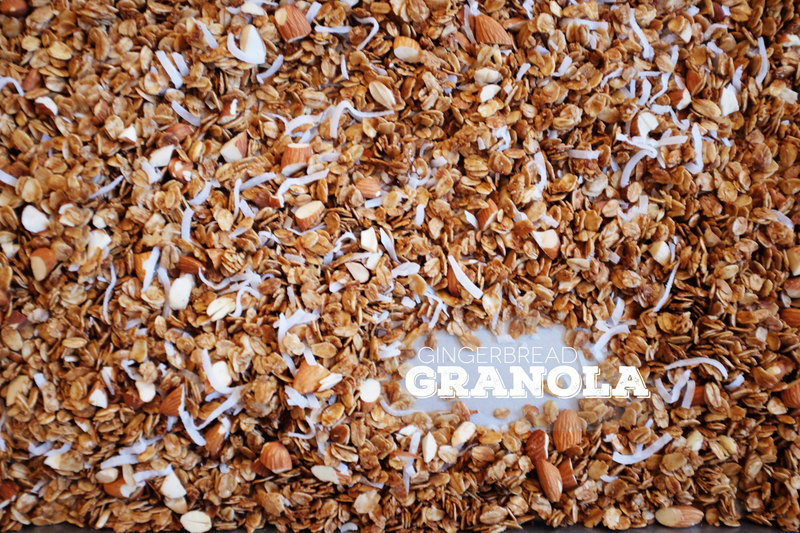 I have made it in cake form, waffles, cupcakes, biscotti, cookies, and now granola! I have been steering clear of all of the above because I love it so and I will eat it so! 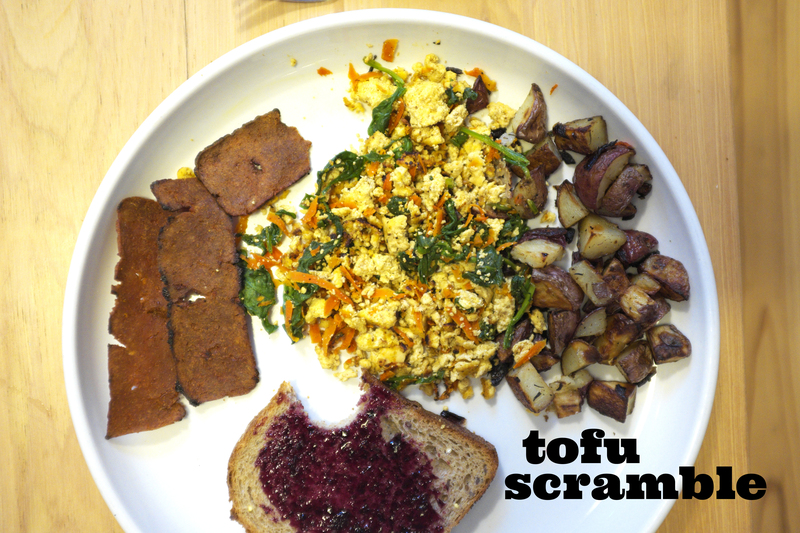 So I’m attempting something on the healthier side – with some granola. It’s not too sweet, but super robust in flavor, just like gingerbread! It came together in no time, and didn’t use very many ingredients at all. All which I had on hand. Next year I hope to add gingerbread house to that list! One of these days Ill work up the courage to make one…. The original recipe and instructions are found here.